W.I.N.G.S. 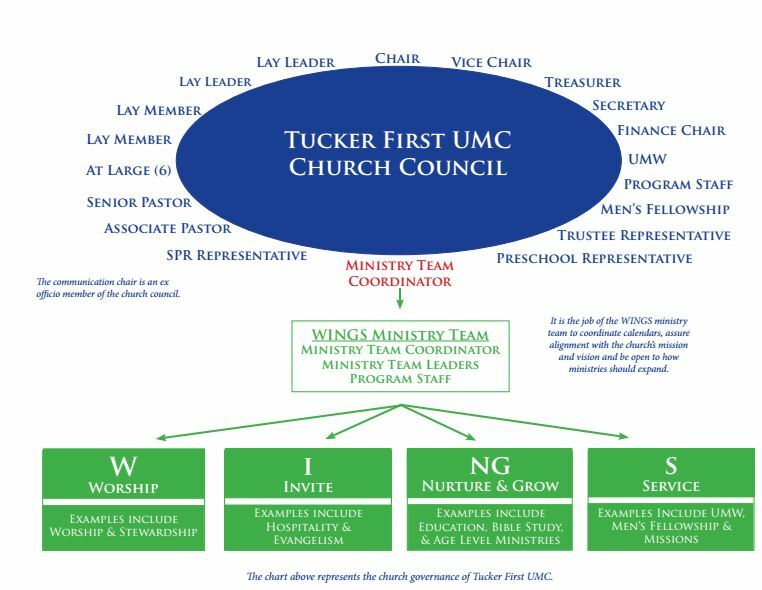 is simply a useful structure for organizing the many and varied opportunities for members to actively participate in the mission of Tucker First UMC: “To make disciples of Jesus Christ for the transformation of the world.” Each letter represents a broad area of ministry and service: Worship, Invite, Nurture, Grow, and Serve. Invite is specifically focused on bringing non-members into the body of Christ through evangelism and hospitality. Both a staff member and a lay leader are assigned to see to the needs of those serving within each area of WINGS. The Church Council normally meets on the second Sunday of January, March, May, July, September, and November at 12:30 pm in Jenkins Hall. The Trustees meet on the third Sunday of each month at 5:30 pm in room 209. The Finance Committee meets on the third Sunday of each month at 7:00 pm in room 209. Any committee can have a called meeting or can change a date if there is a conflict with something like a holiday (Mother's Day, for example). If you would like to review the meeting minutes of any of the groups listed, please contact the chair of that committee. We are committed to having everyone at Tucker First UMC in service. If you want to explore where God wants to lead you in service this year, prayerfully complete the Time and Talent survey! After completing this survey, you will be contacted by someone in your area(s) of interest about using your gifts in service at Tucker First UMC.